Francisco Montejo Quiñonez has been a registered worker at El Sol for about nine years. “I tell my friends that this is our home,” he said. 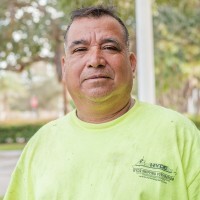 Francisco takes on landscaping, remodeling and painting jobs. He is also a willing volunteer when he is in the labor hall, according to Ismael, our assistant labor coordinator. Since he has been at El Sol for several years, Francisco has contributed to many of our community service events. He said he can remember spending 11 hours working alongside Jocelyn, our executive director, Dora, our associate director, and other volunteers to repair the ceiling at a local classroom. In the meantime, Francisco loves living in Jupiter. He is a big fan of the El Sol morning cup of coffee and feels very safe in this community. “The police take care of us,” he said.